What does it feel like to be dyslexic? Visual Stress is a term used to describe visual discomfort and perceptual distortions in printed text, and is suffered by many people who struggle to read. Around 35-40% of people with dyslexic difficulties are estimated to experience visual disturbance or discomfort when reading print. ⦁ Blurred letters or words which go out of focus. ⦁ Letters which move or present with back to front appearance or shimmering or shaking. ⦁ Words or letters which break into two and appear as double. ⦁ Find it easier to read large, widely spaced print, than small and crowded. ⦁ Difficulty with tracking across the page. ⦁ Upset by glare on the page or oversensitive to bright lights. If a child complains of a least one of these problems or has difficulty at school, they should be referred to an optometrist or orthoptist with expertise in this particular field. In some cases any of these symptoms can significantly affect reading ability. It can also make reading very tiring. Of course a child will not necessarily recognise what they see as a problem, as this is how they always see text. Children who are unaware that they have Visual Stress may come to believe that they must be stupid or slow as they fall below the reading standards of their friends and classmates. This can lead to frustration and lead to disruptive behaviour. It is extremely important that Visual stress is diagnosed as early as possible. Some people experience visual stress when viewing text for long periods. Many dyslexic people are sensitive to the glare of white backgrounds on a page, white board or computer screen. This can make the reading of text much harder. Visual Stress can be reduced by the use of coloured filters: a coloured overlay placed over text or coloured lenses worn in spectacles. The reduction occurs only when the colour is selected to suit the individual. The selection of lenses is best undertaken with the aid of the Intuitive Colorimeter. 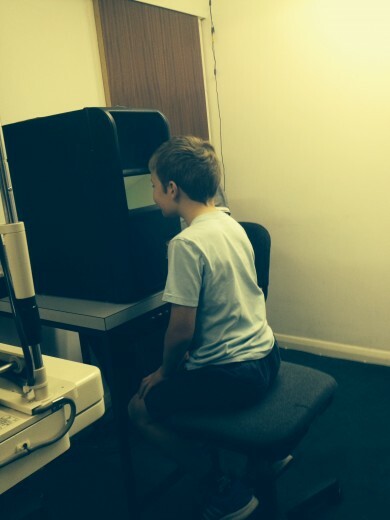 Where to go for a specialist eye assessment and overlays? He is an expert in this field and the coloured lenses that my children wear have made a huge difference to their reading ability. Jacob reads 68% better whilst wearing his tinted lenses and Geneviève 25%. I can’t recommend him highly enough. @LWDyslexia Learning with dyslexia... supporting children and adults with dyslexia and other SpLDs in Devon. We help your children develop vital literacy skills and grow in confidence through hands-on learning and fun teaching experiences. Are dyslexics at a disadvantage in the education system?